R Psalm: PS 126: 1BC-2AB, 2CD-3, 4-5, 6. 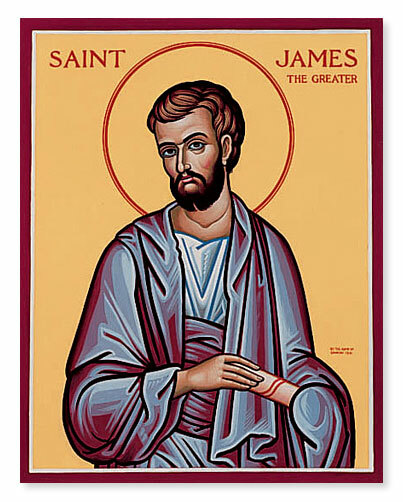 Today, as brothers and sisters in Christ, we come together to celebrate the feast of St James the Apostle. James is also known as James the ‘Greater’, to distinguish him from the other St James, who is known as James the ‘Lesser’. St James is one of the twelve Apostles of our Lord, and as all the apostles did, James travelled around spreading the Good news of the Gospel of Christ. James was also amongst the first to be martyred for the Lord’s sake. Let us look at today’s Gospel Reading of MT 20:20-28, Here we are told how the Mother of St James, and also of St John, begged the Lord for special favour and for power for her sons. The other apostles were not pleased and grumbled at this, as they saw it as an attempt to get favour over them, they bickered and argued over it, but our Lord Jesus rebuked them and had to remind them that true greatness and power lies not in human or earthly favour, or fame, nor was it in prestige or in worldly power, but that greatness is in humility, in leading by example, by having a committed and devoted love and service to each other. The greater a person is, the more humility and dedication to service, that person must have in their lives. James spread the Good news of the Lord to the far away lands, including to where we now know as Spain and Portugal. He encountered martyrdom at the hands of King Herod Agrippa, the King of Judea, because the king wanted to please the Jewish authorities and so to increase his own prestige. Through his martyrdom, James shared in the suffering of Christ, having faithfully served Him by spreading the Gospel around the earth. And as James had shed earthly glories and worldly fame, so he has gained the true treasure which can only be found in the Lord, that is the glory of Heaven and the joy that is to come, an eternity of true happiness and peace. Each and everyone of us should be inspired by what we have witnessed in the life of St James, and also of course, of the other apostles, martyrs and saints. We need to follow in their footsteps and be more like them in our own lives. This is so we avoid falling into the traps of our own earthly pride and arrogance, which is often our undoing. We see it all around us in the world today, where people are more interested in having earthly power, fame, prestige and material things. Indeed, the church itself is not exempt from this. In my time in ministry, I have seen so many times where a member of clergy applies to be incardinated into a church, but only if it is on their own terms- that they insist on having a title or more often still, to be made Bishop, and if the church refuses what they want, they go elsewhere to a church which will give them the power and prestige which they are demanding. They have fallen into the darkness of human power, pride and greed. It was pride, greed and hunger for what we often covet, such as power, greatness, human fame and praise, that has led many to sin and to fall into darkness. We need to be more like Christ, and can take fantastic guidance from the lives and service of St James, the other apostles and saints. Humility! Humility! Devotion! Devotion! Let us learn to overcome our own earthly desires to seek the temporary pleasures of the flesh. Let us aim far higher to seek the only true treasure which is Our Lord and His Love and salvation, just as St James himself did. May Almighty God bless each of us,strengthen us in faith, and awaken within all of us the ever stronger desire to love Him, and to devote ourselves to Him in complete faith and dedication, forgoing the trap of the darkness of earthly power, prestige or earthly treasures, replacing them with the only true treasure which is gained through Our Lord Jesus Christ.